As a homeowner, your work is never done. There is always a new home improvement project on the horizon. And what better to tackle this summer than a brand new concrete or decorative stamped concrete patio. This will not only add to your property value, but also give you the perfect venue for your next barbeque. Before you go any further with your plans, take a step back and let’s think about this. Every one of your neighbors has a boring concrete patio. You need something that will help you stand out from the crowd. You need something that will not only enhance the visual appeal of your patio, but also increase its functionality. This is why you should consider a Patio Railing. A patio railing will help add visual appeal to your yard. A patio railing will make your patio safer, especially if you have young children or pets. 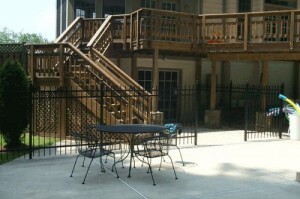 A patio railing will increase your property value. A patio railing will make your home easier to sell in the future. Hercules Fence of Northern Virginia offers a wide variety of patio railings – from wood railings and steel railing to aluminum railings and pipe railing. Best of all, our patio railings meet standard building codes. 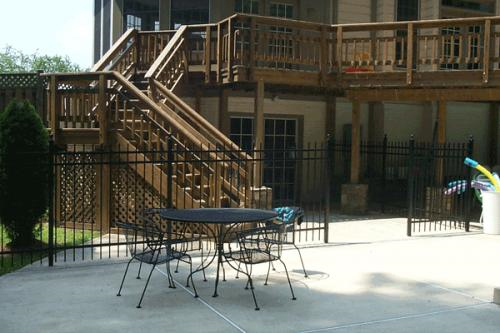 If you think a patio railing is right for your home, give the fencing experts at Hercules Fence a call today. We are here to help. With over 50 years in the fence business, Hercules Fence knows a thing or two about fences of all shapes, sizes, and materials. Hercules Fence has you covered! If you have any questions about why you should consider a Patio Railing, please contact Hercules Fence of Manassas, Virginia today by calling (703)551-2609 or visiting our website. Also, check out Hercules Fence of Manassas on Facebook,Twitter, Google+ and YouTube! This entry was posted on Friday, July 26th, 2013 at 2:17 pm. Both comments and pings are currently closed.